Eliot Porter (American, 1901-1990) created a new way of viewing the world by introducing color to landscape photography, which today has become commonplace. Porter began working in color in 1939, long before his fellow photographers accepted the medium. Trained as a chemical engineer and a medical doctor, Porter began his career in photography in the early 1930s by making black-and-white prints in his spare time while working as a bacteriologist and teaching at Harvard University. It was around this time that his brother, Fairfield Porter, a realist artist and art critic, introduced him photographer and gallery owner Alfred Stieglitz. Offering guidance, Stieglitz began to critique Porter’s black-and-white photographs and in 1938 exhibited Porter’s work in his New York gallery, An American Place. The success of the exhibition prompted Porter to leave Harvard and pursue photography full-time. The year after his exhibition at Stieglitz’s gallery, Porter began working in color with Eastman Kodak’s new dye transfer process, a technique he would use the rest of his career. Porter taught himself the delicate, multi-step process for creating color photographs using Kodachrome, the color transparency film. For the next three decades Porter struggled against the perception that color photography was inappropriate for artists because it produced images that were too literal. He hoped that his color photographs would bring a new facet to the perception and representation of nature in photography. Porter used the color process to create highly expressive images by slightly increasing the brilliance, contrast or saturation in the film transparencies. He produced seven portfolios of nearly 8,000 prints using the complex dye transfer process from 1953 to 1984. Correspondingly, between 1951 and 1984 Porter photographed the region of the United States west of the 105th meridian, which runs north and south through Denver. 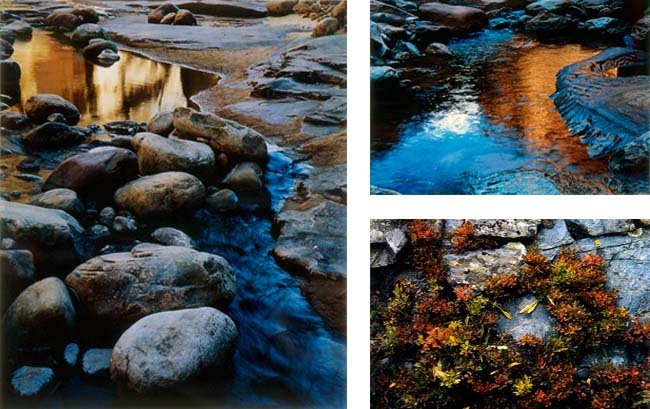 The natural intensity of color combined with a sharp contrast between light and shadow allowed Porter to create a very wide variety of images that range from panoramic landscapes to close-ups of plant life and the textures of rock, sand and water surfaces – the latter of which verge on the abstract. As part of this series Porter photographed the Colorado River’s Glen Canyon in Utah in the early 1960s before it was flooded to create Lake Powell. Over a fifty-year career that includes work from Maine to China, Porter built a broad popular reputation based on thousands of richly hued prints and twenty-five books. His work energized environmentalists, drew accolades from museums, and created the foundations for today’s color nature photography. Porter died in Santa Fe, New Mexico in 1990 and bequeathed his personal archive to the Amon Carter Museum in Fort Worth, Texas. The UW Art Museum permanent collection contains 30 photographs by Porter, which were acquired before his death, with images of California, Idaho, Oregon, New Zealand, Africa and Antarctica – in addition to the photographs in this exhibition.